With easy access to multi-core parallelism, the machine learning community needs to take this additional form of ﬂexibility into account. 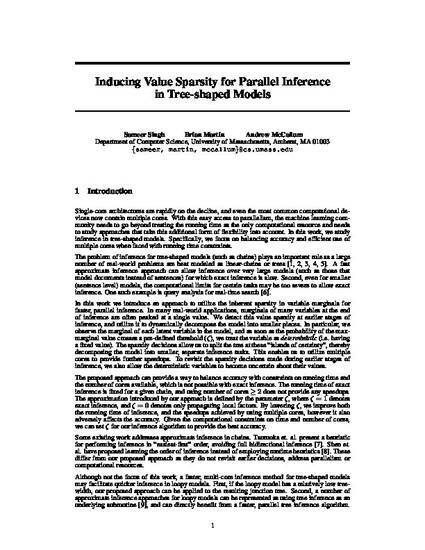 In this work, we study inference in tree-shaped models. Since the marginals of many variables at the end of inference are often peaked, detecting this value sparsity at earlier stages of inference can be utilizes to dynamically decompose the model into smaller pieces (“islands of certainty”). Given the computational constraints on time and number of cores, we can set a parameter for our inference algorithm to provide the best accuracy.